There’s no denying that the ultimate catch that most fishermen are after here is big Chinook salmon…a chance to catch that trophy of a lifetime! But there are also other salmon species, Halibut and many kinds of bottom fish out here that can also give you an adrenaline rush and provide delicious table fare. 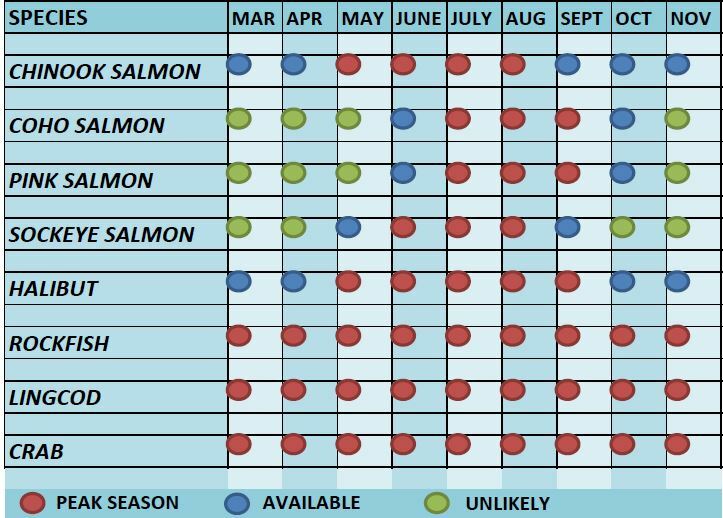 If you’ve ever been confused listening to people talk about the different species of pacific salmon, you’re not alone. No one knows why, but for some reason each of the five north american pacific salmon have two or more names. It’s really not that complicated! ⚫ Chum…Dog, Keta or Silverbright salmon. 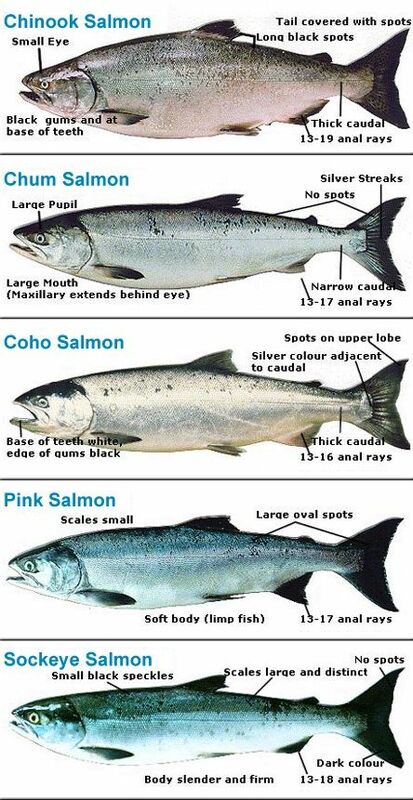 ⚫ Coho…Silver salmon or Silvers. Halibut anyone? Halibut can be caught here all season long…they’re fun to catch and are delicious! So delicious that if you buy Halibut in a store, the market price this year is $28./lb. Rockfish and Yelloweye…There are so many sub-species, you never know what’s coming up next. Another white meat fish, not the hardest pulling fish out here but very good eating. Lingcod…a west coast favorite! Fun to catch and prized for its delicious meat. Who knows what else you might catch in the depths around here? Some fish are strange, some fish are huge, some don’t even look like fish…mostly we release them, but they always provide wonder and excitement! 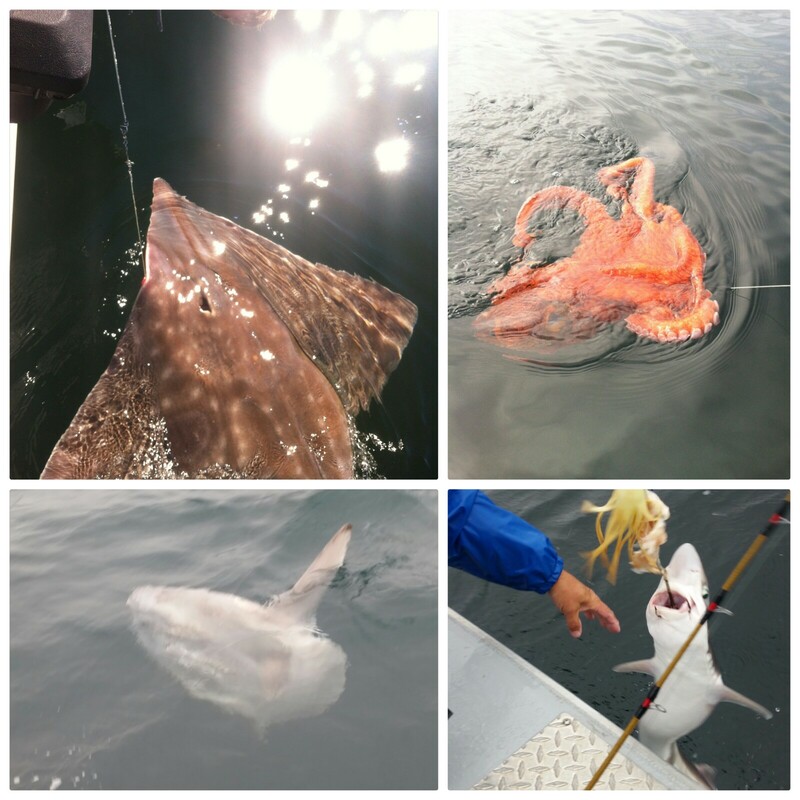 Some examples are Skates, Octopus, Eels, Ratfish and Sharks. When it comes to successful fishing, it’s not just being in the best spot with a professional guide…it’s being in the right place at the right time! Check out our local area “best times” custom fishing calendar below. Catch & release or keep your limit, your choice! What we’re really providing here is the experience and adventure. The fish come and go, but the memories last a lifetime! So if you like to catch & release…we’re all on board. We’ll make sure you get some awesome pics and then carefully revive and release the fish. If you choose to keep your catch, that’s great too. To ensure that this great fishery is here for the future, B.C. fishing regulations determine the allowable harvest. **Possession limits of your catch are 2x the daily limits. Note: These 2018 daily and possession limits are subject to in season conservation announcements by DFO. We will update this page if any changes do occur.